I personally really enjoyed this book, and I liked it even better than all of the books in the Masterminds series. This is because even though Masterminds was very action packed, Restart has a moral to the story, and a very inspiring one as well. It is less about action, but more about humor and a certain depth to the story's characters. It has a great ending that I enjoyed a lot, and completely concludes the story so there is no need for another book. I think Restart can be enjoyed by anyone, and it doesn't matter what book genre you like the most. Similar to Masterminds, the story is told through multiple first-person perspectives, not just from the main characters, but also from the people who know him. This switch of narration provides for a more in-depth story telling experience. This book asks the question, if a cold-hearted bully has the chance to restart his entire life by falling off a roof and hitting his head, and loses his entire memory of being mean, will he be able to redeem himself? 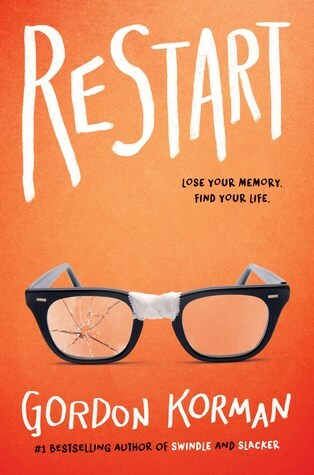 It is a story of redemption, and I think that it lives up to its title of "Restart". The first thing that Chase remembers is falling off a roof. He hits his head and gets a concussion that is so bad that he loses his entire memory of his life before the accident and who he is as a person. He doesn't even recognize his own mother at first in the hospital when he wakes up, and has to be reminded of his name. He is sent back to school with caution, and many people recognize him. It is strange to be recognized by so many people who you don't actually know anymore. Their reactions are good and bad: some treat him like a hero, and others cower in fear at the sight at him. It turns out, he used to be the school's football captain and also the ringleader of the worst bullies around. He already has a reputation for tormenting others. When it comes down to being sent to court, a theft of a Medal of Honor, and a viral video of a kid being crushed under a tuba--will he still be able to redeem himself? Will everybody be convinced that his personality has changed because of his fall? Or will his chance to restart his entire life as a bully not mean anything? Read to find out!